Daniel Morgan [1736-1802] was an early soldier in the American Colonies, during Pontiac's War  and Dunmore's War . During the Revolution, he served as colonel of a Virginia regiment, then became a Brigadier General. He commanded the "The Rifle Brigade", serving with distinction at Quebec, Saratoga, and the Cowpens. He commanded the Virginia Militia in the suppression of the Whiskey Insurrection of 1794 in Pennsylvania. He was a representative from Virginia from 1797-99. The area was originally part of Madison County, which was formed in 1812, before Illinois become a state. The present-day counties of Cass and Scott were part of Morgan County until 1837 and 1839, respectively. The boundary line with Cass County was originally further north than the current boundary which was established in 1845. The first settlers began arriving in Morgan County around 1818 but it was not until 1823 that the county was formally organized. Jacksonville was laid out on a 40 acre tract in 1825 and was chosen as the Morgan County seat. Named for General Andrew Jackson, the city was incorporated in 1867. Illinois College granted the first bachelor's degree in the state in 1835 and began the first medical school in Illinois in 1843. The first Jacksonville churches were organized in these early years. Among the prominent preachers of the time were Peter Cartwright (Methodist) and Barton W. Stone (Christian Church - Disciples). Because of humanitarian and political influences in Jacksonville, three state institutions for the care of the handicapped were located here. The Illinois School for the Deaf was chartered in 1839 and began classes in 1845. The Illinois School for the Visually Impaired began as a private school in 1847 and was turned into a public institution in 1848. The Jacksonville Mental Health and Developmental Center was authorized a charter in March, 1847, only two months after Dorothea Dix, the legendary champion of prison and state hospital reform, appealed to the state legislature for it. Jacksonville has contributed a remarkable number of leaders and innovators to the state and to the nation. In 1833, Jonathan B. Turner settled in Jacksonville as a professor at Illinois College. He originated the osage orange hedge which became the first effective method of fencing the North American grasslands. Turner was also as great proponent of the public school system in Illinois and is recognized as the father of the land-grant college idea. His goals for the public school system were realized in 1840 by an Illinois College graduate and Jacksonville teacher, Newton Bateman, who organized the first free public school in Illinois and later became president of the Knox College in Galesburg, Illinois. Lincoln's arch-rival Stephen A. Douglas became Morgan County prosecuting attorney in 1835, and William Jennings Bryan, an Illinois College graduate, practiced law in Jacksonville from 1883-1887. Jacksonville also contributed three governors to Illinois - Joseph Duncan (served 1834-1838), Richard Yates (served during the Civil War, 1861-1865), and Richard Yates, Jr. (1901-1905). Governor Duncan's home still stands within Duncan Park on West State Street. During the Civil War, Ulysses S. Grant camped his Illinois Division (21st Illinois Infantry) on what is now the Morgan County fairgrounds. In 1864, Dr. Greene Vardiman Black, the father of modern dentistry, began his Jacksonville practice which would continue for 34 years. His Jacksonville office has been reconstructed as an exhibit in the Smithsonian Institute. In 1900, William E. Sullivan began manufacturing Ferris wheels in Jacksonville and set his first model in operation on the public square. Now in its third generation in business, Sullivan's organization, the Eli Bridge Company, is the oldest firm in the country making Ferris wheels as a stock item, and is one of the few such firms, in the world. One of the three bandstands built around 1879 on the Jacksonville Mental Health and Developmental Center grounds was recently moved to the Smithsonian Institute for restoration and display. 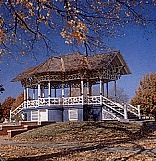 The bandstand has been restored to its original state and plays host to numerous concerts as it once did in Jacksonville.